The Eiffel Tower won’t be lit up with colors of the Syrian flag in memory of victims, nor will viral #neverforget hashtags make the rounds on social media — and we don’t expect too many official condolences issued from European or Western political leaders, as has happened with terror attacks that hit the Western world over recent years (though to its credit the US State Department tonight belatedly condemned the “barbaric ISIS-claimed attacks that took place”). This in spite of the fact that as ISIS is on its last legs in the tiny southwest pocket of southwest Syria adjacent to the Israeli-occupied Golan and the Jordanian border, and as Syrian and Russian jets continue to pound Islamic State positions, “whole families were butchered, scores of on the spot executions, children, women & elderly killed in their homes, another dark day for Syria,” in the description of Syrian-British reporter Danny Makki. 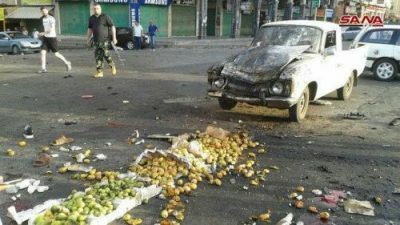 Early Wednesday morning four suicide bombers stuck a popular open-air market and other locations in Sweida city, a provincial capital in the country’s south. Syrian state media said a motorcycle bomber detonated himself in the marketplace just after dawn, after which a series of other ISIS attacks followed.